Dupuytren’s contracture is a painless deformity of the hand in which one or more fingers are bent toward the palm and can’t be fully straightened. It results from a thickening and scarring of connective tissue under the skin in the palm of the hand and in the fingers. 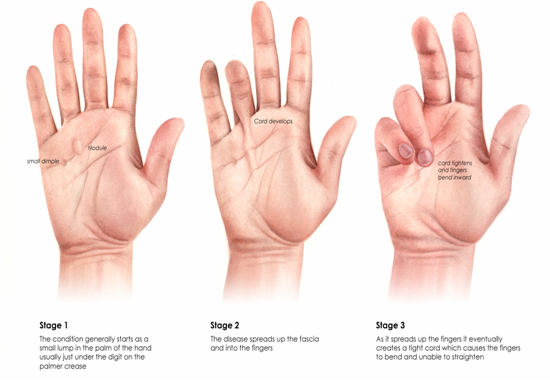 Dupuytren’s contracture typically progresses slowly, over years. The condition usually begins as a thickening of the skin on the palm of the hand. A firm lump of tissue can be felt on the palm. This lump usually is not painful. 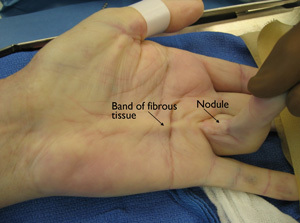 In later stages of Dupuytren’s contracture, cords of tissue form under the skin on the palm and fingers can not be extended. As these cords tighten, the fingers might be pulled toward the palm. The ring finger and pinky are most commonly affected. Dupuytren’s contracture occurs most commonly after the age of 50. People with diabetes are reported to have an increased risk of Dupuytren’s contracture. Trigger finger (stenosing tenosynovitis), is a condition in which one of the fingers gets stuck in a bent position. The finger may straighten with a snap — like a trigger being pulled and released. 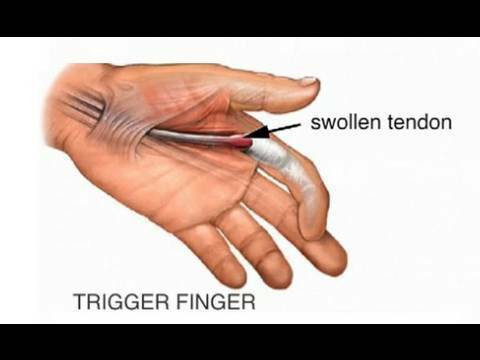 Trigger finger occurs when inflammation narrows the space within the sheath that surrounds the tendon in the affected finger. If trigger finger is severe, the finger may become locked in a bent position. People who have diabetes or rheumatoid arthritis are at higher risk of developing trigger finger. Some people experience improvement by icing the palm several times a day. Others see more benefit with warm-water soaks, particularly first thing in the morning. Gentle exercises may help to maintain mobility in the finger. An injection of a steroid medication near the tendon sheath may decrease inflammation and allow the tendon to glide freely again. This is the most common treatment, and in people who do not have diabetes, it is effective in up to 90 percent of patients. In people with diabetes, it is effective about half the time. Surgery: working through a small incision near the base of your affected finger, a surgeon can remove the constricted part of tendon sheath. This procedure is usually done in an operating room.